This article first appeared on East Niagara Post on January 6, 2015. It is repeated here as I work to put all my book reviews in one place. They will be posted on Thursdays or Fridays and only be altered from the original in that I will add publisher information and pages. Hopefully, by revisiting these reviews, other people might find a book they'd like to pick up for their own enjoyment. Far too often, post-apocalyptic novels are entrenched in marauding bands of zombies and endless war with various factions around the country. It’s as if for some reason, Americans lose all sense of brotherhood and turn on each other like rabid dogs when they lose their electronic crutches. These novels depict the extreme worst of surviving humanity. So many of this genre of novels turn me off because of these reasons. It’s hard to find such a work that details how people could come together after such a tragedy. 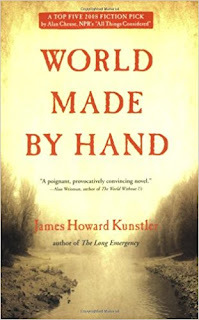 With World Made By Hand, by James Howard Kunstler, we get a truer look at a post-apocalyptic future. Kunstler, an author better known for nonfiction works detailing what could happen when the oil runs out and we are thrust back into the 19th century, uses that knowledge to weave a tale of what happens afterward. After two nuclear bombs strike Los Angeles and Washington, the United States teeters on the edge of collapse. The electrical grid sputters and nearly dies, but electricity stays very erratic. In some places, they must learn to go months without that particular luxury. While the country is struggling with its cohesion after the double attack, a return of the Spanish Influenza wreaks havoc on the spiraling civilization. Pockets of society are cut off from one another as the survivors band together for protection. Of course, in every society, there must be a group of people who will take advantage of those they see as weaker. In this case, it is Wayne Karp who is the heavy of this small town in the Hudson Valley. He runs the dump and uses it for a mine to supply the rest of the town with things they need and desire. This he does not out of the goodness of his heart, but to make an exorbitant profit and keep his crew living at relative ease under the circumstances. It is former computer programmer, Robert Earle, who ends up the new leader of the fictional town of Union Grove, New York. It is through a murder perpetrated by members of Wayne Karp’s crew. Earle assumes the office of mayor and he is encouraged by other town folk to make sure Karp is brought to justice for the heinous deed. Stephen Bullock, the begrudgingly appointed sheriff of the community agrees to bring Karp and his men into custody. But he wants a favor in return. Bullock likes living alone with his family away from most people. However, he trades along the Hudson River. One of his boats never returned from Albany, and he wants Earle and some of the men from town to travel there and bring back his men and goods. It is in Albany that we discover what will happen to our urban centers when the oil trade collapses and all our modern amenities have disappeared. Cities such as Albany cannot sustain themselves. There are far too many people and much too little space for food production. Roving bands of criminals have sectioned the city into turfs, killing off the weak and cannibalizing what’s been left behind. While the people of Union Grove are adjusting to the complete change in lifestyle, a new group of people move into the community and upset the balance with their new ways. The New Faith Church and their mysterious, charismatic leader, Brother Jobe, take over the abandoned high school. The residents are very wary of the interlopers until the church assists with many of the difficult tasks around town. In the end, Wayne Karp and his group receive punishment, Bullock’s men and boat return from Albany, the New Faith Church ingratiates themselves to the people of Union Grove and weave themselves into the tapestry of the community, and Earle settles in as the newly appointed leader of the town. The world may have inexorably reverted to a nineteenth-century way of living, but this small group of neighbors persevere. Too many times in post-apocalyptic fiction, when the world collapses, the result is too unrealistic. I don’t want to read a zombie novel. Nor do I want to fall into S.M. Stirling’s world where people immediately drop all their modernisms and abandon their language for Tolkein’s Elvish. Both these types of scenarios seem unrealistic. The wonderful thing about Kunstler’s novel is that we can relate to the people who inhabit the pages. The world is still recognizable, albeit drastically altered in their daily lives. Just like would probably happen if this scenario were to actually play out, the weakest of the people die off or are killed off by stronger groups. It is survival of the fittest in a harsh environment most of us are not ready or prepared to embrace. The author’s winding narrative moves along swiftly and makes it difficult to stop. The decisions that the characters have to make are written with the character’s indecisiveness in mind. As I’ve written before, I really like character-driven novels. This one revolves around each of the major characters and the effect that each of them have on each other. What I didn’t realize when I started this book was that it was the first book of a trilogy. Initially, I thought that I would not write reviews of a series. However, this book was so well written and didn’t fall into the the same post-apocalyptic trap so many other similar novels do, that I felt a review would be fine. I am not sure if I will review the other two books, though I am sure I will be reading them. 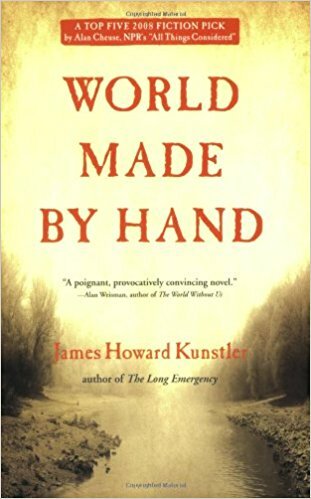 After all that, World Made By Hand by James Howard Kunstler is a good novel that stands on the merits of its potential accuracy of a world devoid of modern amenities and ravaged by illness. This book is well thought out by an author who has written nonfiction pieces about the collapse of a world economy after the oil runs dry. He uses these earlier works to create this imagining of a not so distant future. I assure you there will be no zombies chasing you through the pages. Craig Bacon keeps extra food on hand at all times. He will partner with Bob Confer when the end of the world comes. Between the two of them, their families will survive.